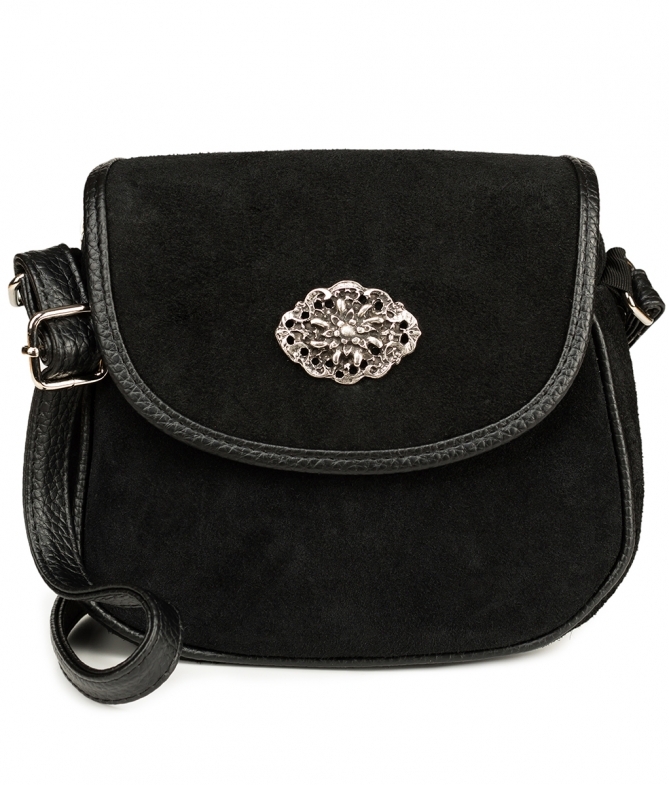 Traditional bag in black suede leather for women. A beautiful Dirndl needs a matching bag. This model from Schuhmacher remembers tradition and focuses on restraint. Soft velour leather, subtle decorative piping and a classic colour characterise the shoulder bag. The only ornamental element is a large metal appliqué in edelweiss form. The narrow strap made of textured smooth leather is firmly attached to the bag and can be infinitely adjusted. The main compartment can be closed with a practical magnetic closure and is additionally secured with a zip. The bag is the perfect size to safely store all the necessary details such as powder compact, lipstick, keys, money and mobile phone. Super schöne Tasche, Größer als die meisten anderen Trachtentaschen. Komplett verschließbar mir Reißverschluss.